JackpotCapital.com has made it easier to join their VIP club and has added to the benefits for members. A new VIP Customer Support Team will attend to the needs of regular players looking for higher table and wagering limits and more generous comp points. 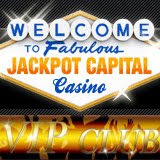 There are various VIP entry levels at Jackpot Capital, with corresponding benefits. The new “VIP Silver” offers VIP benefits to players when they accumulate just 1500 Comp Points in a 90-day period. VIPs earn comp points at a faster rate than regular players. They also receive extra non-deposit bonuses from $50 - $400 plus a monthly 100% deposit match bonus. The US-friendly online casino is well-known for having some of the best games and biggest jackpots available to US players. Jackpot Pinatas is currently over $1.5 million and begging to be won. Aztec’s Riches is just over a million and Midlife Crisis/Shopping Spree is almost a million. JackpotCapital.com will fly the winner of their current affiliate contest to London in January. Interested online casino affiliates should contact affiliates@jackpotcapital.com.